Good morning to you all! Today I'm sharing swatches of the new Pretty and Polished Summer Camp Collection. This collection was released very recently and it's super varied, so I wanted to make sure to share all of these with you in one post so you can see how well balanced this collection is. First up we have Cheer Camp. Cheer Camp might be my favorite in the whole collection. 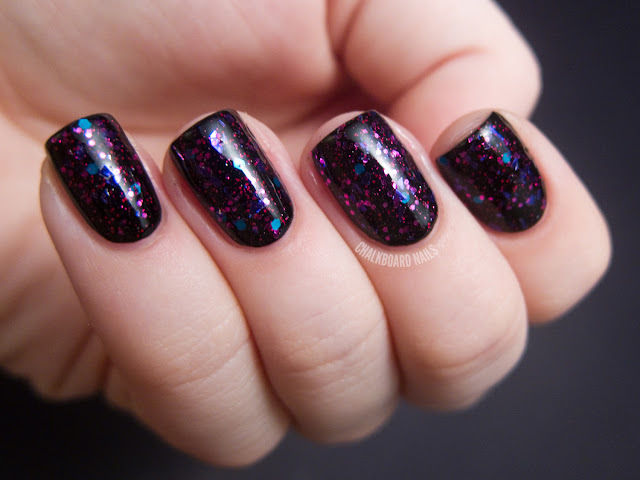 It's milky base with pastel pink and purple glitters is very subtle and girly. I predict that this will be a favorite among those of you who love the light bases with glitters, like Party On My Yacht. Here I've shown three coats of Cheer Camp on it's own. 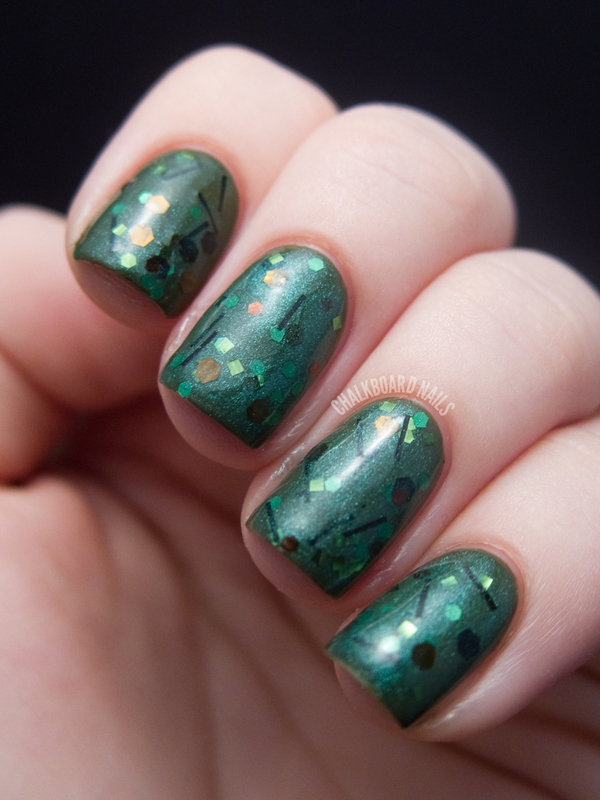 Peace Camp is a serene shimmery aqua/teal/blue shade with blue and pastel green glitters. For this swatch I have layered two coats of Peace Camp over China Glaze Agent Lavender. It's pretty sheer so I definitely recommend layering this one. It is also imperative to let your manicure dry between coats so you don't drag the shimmer and ruin the evenness. I think the small dark blue glitters really make this one special. 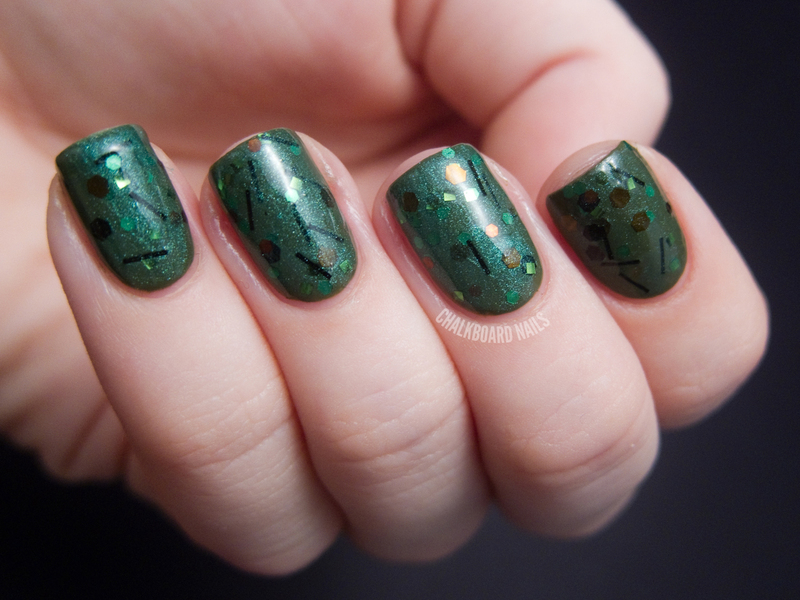 I kind of want to go swimming in this polish. I imagine it would be like a spa. Third, we have Boot Camp. For this swatch, I have layered two coats of Boot Camp over China Glaze Westside Warrior, a dusty olive green creme. It's easy to see the amount of green shimmer packed into Boot Camp's base. In addition to the shimmer, it also boasts a number of different glitter sizes, shapes, and colors, like brown, green, & black... bar, hex, & square. This is another one that I would take your time applying, to ensure even distribution of glitter and shimmer over your whole nail. Finally, take a look at PHAT Camp. I think this polish will be the most popular from the collection -- it's super intense (in the best way). It applies really well and evenly. I have layered two coats of PHAT Camp over black for this swatch. It comes in a clear base, so you can layer this however you want without concern for matching. PHAT Camp is primarily made up of small and micro pink glitter, but it also has teal glitters and purple shard glitters. It truly has a lot going on, but it's still well balanced and beautiful. For the diva in all of us. What do you think? Which P&P "camps" will you be attending this summer? Pretty and Polished can be found on Facebook (like her page for more info on restock dates and times) and is sold on Etsy. 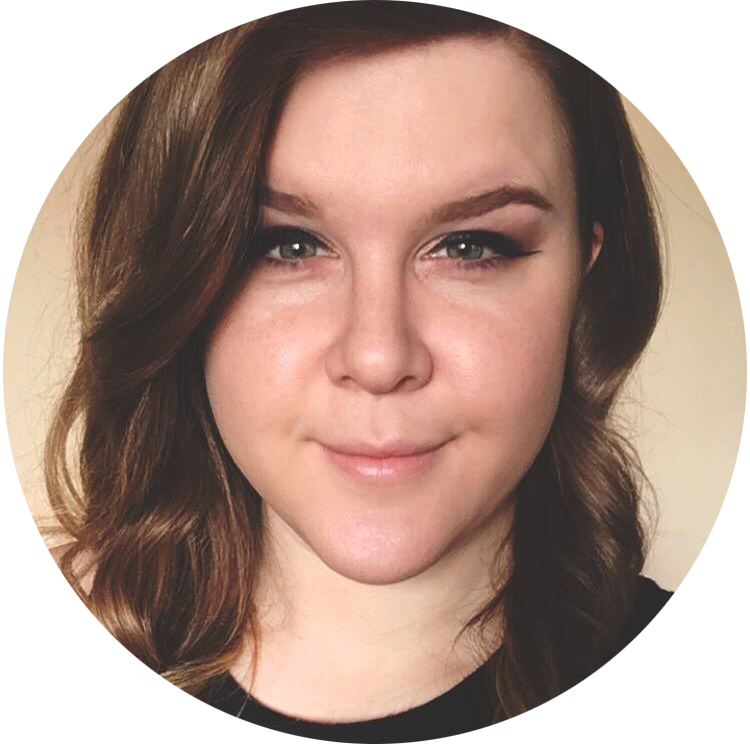 She will soon be selling her products on Llarowe, too (congrats)! If you'd like to see more photos of this collection, including different layering options, check out Chelsea's post. I ordered Phat Camp, I can't wait to get it, it looks awesome!! love peace camp and phat camp!! Cheer Camp and Phat Camp are my two favorites! They're so gorgeous. I want to get my hands on PHAT Camp and Cheer Camp...and maybe Boot Camp! :) Love her polishes! PHAT Camp is obviously the star of the collection and everyone will be wanting to ger hands on it. I, however, like Peace Camp and Boot Camp much better. I love Cheer Camp and Phat Camp. Awesome swatches! I got Boot camp this morning! Now I need Phat camp! oh my goodness, Phat Camp!!!!!! Wow! Trying to decide between them all! I love how subtle, yet gorgeous Cheer Camp is. I love Phat Camp too! 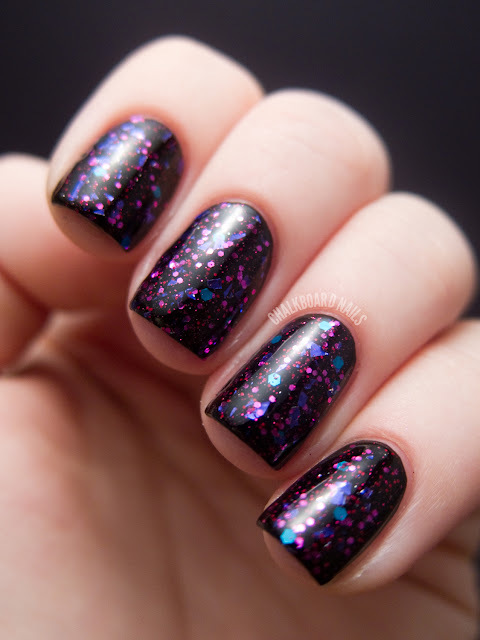 Lovely shades, I just can't get enough of glitter, haha! And I just want to say I love your blog and your nails. You have a huge fan here in Brazil, lol! I'm loving Boot Camp the most! So pretty! I definitely need the rest of the Summer Camp collection! I only bought Phat Camp! Nice. PHAT Camp over black reminds me of butter London's "The Dark Knight" . Ohhh I so want cheer camp! Love it! oooo I am complately lemming PHAT Camp and Cheer Camp! I got PHAT Camp today and I can't wait to wear it! I ordered Cheer Camp and PHAT Camp, so pumped about getting them! Phat camp almost definitely what a gorgeous colour! Haha love the Cheer Camp polish!! wow, Cheer camp and Phat camp are definitely my favourites! I like the soft colours in Cheer camp, very subtle! Thanks you so much for sharing! I so need Peace Camp and Phat Camp!